Since LinkedIn introduced Video last August our newsfeeds have been inundated with footage of people turning the camera on themselves to leverage this new medium in self-promotion. Unfortunately a lot of it doesn’t make for compelling viewing on a platform that’s designed for professional networking. 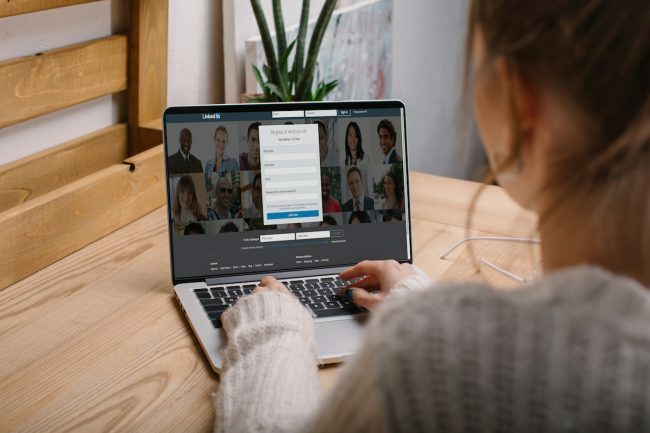 We understand that it can be difficult to film yourself, particularly the first few times so we’ve put together our five top tips to follow when shooting your own video for LinkedIn. Short and sharp means no more than 2 – 3 minutes. The newsfeed on social media channels, including LinkedIn, encourage people to consume bite sized chunks of content and then to continue scrolling through a never ending feed. Before you start filming have a clear idea of what your message is so that you can deliver it concisely, without rambling. Use it as an opportunity to push viewers looking to learn more off to your own website, blog or even a LinkedIn article. Is there a location you could shoot in that gives context to your content? Are you delivering a message about something you’ve learnt or someone you’ve met at an event? If so it makes sense to shoot with the event in the background, provided what’s going on in the background doesn’t distract the viewer from your message. Otherwise look for a neutral background for shooting your video against that conveys a level of professionalism that your peers on the platform would expect in order to do business with you. Do not shoot in your car – remember this is LinkedIn, not Facebook! Once you’ve chosen your location, make sure your face is well lit so that people can clearly see you delivering your message. It’s our expressions that help to convey emotion and authenticity. Make sure you’re not standing in front of a window with the sun streaming in behind as this will make your face appear dark. If needed, grab a desk lamp and position it in front of you, out of the camera’s view, to light you up a little. Soft light is always more flattering. Mount the camera on a flat surface so you don’t need to concentrate on holding it still whilst trying to deliver your message. If you’re going to be shooting yourself regularly on video then it’s probably worth investing in a small tripod for your smartphone. There’s an affordable range available, depending on your device and needs . Position the camera so it’s either directly level with you or looking down on you slightly. Don’t shoot upwards – no one wants to see up your nostrils thanks! Native video on LinkedIn can be shot in either horizontal or vertical format. Vertical videos are cropped to a square shape in the feed, whereas horizontal videos are shown in full in the feed. Consider what it is that you’re filming. If you’re conducting an interview with another person or more then shoot in horizontal so there’s no risk of heads being chopped off. Horizontal is also ideal if you’re wanting to capture a particular background behind you – such as a panoramic view. Following these tips will help you produce a video that’s more likely to be watched on LinkedIn. Of course, if you’re looking for a professional capture or editing – or a content strategy for your profile then contact us so we can assist.